The last of the higher activity liquid waste produced during Dounreay Fast Reactor (DFR) fuel reprocessing has been made safe for future generations. It is an important milestone in the immobilisation of the historic liquid waste, known as raffinate, created from reprocessing undertaken during the operation of Dounreay’s three reactors. The achievement comes just days after Dounreay announced that all of the reactor’s liquid metal coolant had been destroyed. 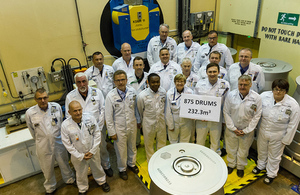 Dounreay’s Waste Director, Bruce Covert, welcomed the news: “Encapsulation of 232 cubic metres of DFR raffinate is a significant achievement for the whole site, with the material grouted and suitable for long term storage in 875 drums. Batches of liquor were remotely transferred from underground tanks to a cementation plant. Here it was neutralised and mixed with cement powder inside 500-litre drums in a remote handling facility, making it passively safe for long-term storage or disposal. The cementation plant will now undergo some engineering modifications and enhancements before the workforce begin to immobilise the Prototype Fast Reactor (PFR) raffinate.